Its official - a bank holiday scorcher and perfect weather for haylage - its the best day of the year. With help from all sides we've done it again for 2017 and I can guarantee that tonight we will drink wine and sleep well! This is Jet, the ex-racehorse who arrived with a diagnosis on MRI of navicular bone damage. He had fairly "typical" ex-racehorse feet with under-run heels (above on day 1) and thin, flat soles. His photos are tricky to make out but you can see that he has already grown quite a bit of new hoof as the old nail holes, which you can see a quarter of the way up his foot in the first photo, are now at ground level. His foot is also changing at the back but the result at the moment is to make it look pretty odd from this angle. These photos give you a clearer idea of what is happening. The frog is broader now (below) than it was on day 1 (above) and his heels are less under-run. There is not an enormous amount of change from this angle but if you compare the hairline you can see it is more level in the lower photo (today) than it was when he arrived (above); a good indication that his digital cushion is rebuilding. The picture on the right foot is similar, with reasonably good growth over 4 weeks and the palmar hoof beginning to develop. Now that Jet is landing better he is starting to work the frog and digital cushion more effectively and as a result its stronger today (below) than it was on day 1 (above). More on Jet soon, as he still has lots of good changes to make over the next few weeks. With Dash going home at the weekend we also had a new arrival, a thoroughbred called Freddie. He has a fairly complex history with additional issues beside his lameness which may or may not impact on his rehab; we will know more as we get to know him better and start working him. He has been diagnosed with DDFT damage to his left front but is landing toe first on both front feet and is lame and short-striding in trot on a circle, as you would expect. He has been shod up until the last year and there are aspects of his feet which are encouraging, as his frog is reasonably healthy and apart from a couple of cracks he has good hoof wall. However as well as his toe first landing he has a medio-lateral imbalance, again on both feet, which means he is landing on the lateral side of his feet. We will of course be monitoring him for change over the next few weeks and there will be more on him soon, I hope. Shannon has now been here for nearly 8 weeks. She arrived in shoes with a very weak frog and digital cushion and a pronounced toe first landing. She is now, as you can just see, growing in a new hoof capsule at a much better angle. This will considerably shorten her toe once it has fully grown in. Shannon has been landing heel first for a few weeks now and although she is quite stiff her better landing is having a good effect on her feet. The improvement is clearest from this angle where the development of the digital cushion is evident. This is her worse foot as she has a sheared heel on this side. Again, there is a better angle of growth which will result in a more balanced hoof capsule. The sheared heel - or split central sulcus - is healing up thanks to the better stimulation from her now landing heel first and regular treatment with derma-gel. Of course Shannon has a lot of foot growing still to do but she has made a good start. Dash is going home at the weekend so its time for his 12 week update. As you can see, he has made some big changes to his feet and there will be more to come as the new hoof capsule (the steeper angle which you can see in this lower photo) fully grows in. The new hoof capsule will give him a shorter toe and although it looks funky at the moment his feet should look very nice in a few more months. This is the business end - where the most important changes need to happen. There is already more structure to the digital cushion and better depth to the frog but this should steadily get better again as he continues with work. The balance of his foot has also changed; instead of being weighted to the front, as it used to be, there is now a lot more development in the back third of the foot. 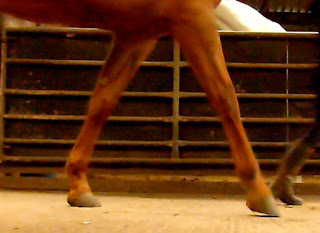 No trimming has been necessary to achieve this; its a function of a healthier hoof growing in. Although these photos are at different angles I hope its still clear that the lower photo shows a stronger and more stable limb. This foot was in better shape than his right foot but still needed a much stronger digital cushion and frog. As with the right foot, much better balance in the hoof capsule now. I will upload his landing footage and post it here as soon as I can! Dallas has been here for 6 weeks now and its taken until now for her to change her landing. Many horses go from toe first to heel first relatively quickly but she has found it more difficult and its only really this week that she has started to engage the back of her foot properly. Her landing was extremely toe first when she arrived and its proved a stubborn habit to change so its good to see the first tentative evidence of better movement in her video. At the stage its still tricky to spot, even on slow motion footage, but the stills confirm that she is actually using her palmar hoof now. She should also begin to develop a longer stride as she becomes more confident with her new landing. His photos do not show dramatic changes but the back of his foot is getting stronger and as this happens his toe is shortening and his foot as a whole is becoming more supportive. Of course there is still a very long way to go; Jet will grow in a hoof capsule at a steeper angle and it will be at least 6 months before he has "new feet". Its good to see though that he is making progress and for an ex-racehorse his feet are changing quite rapidly.